Vacations to the southwestern countryside have long been a staple of French life. People escape urban centers to visit ancient churches, beautiful gardens, and magnificent castles. They enjoy outdoor activities like hiking, cycling, and camping. One of the most important parts of France’s national culinary heritage is the production of foie gras, the liver of a specially fattened duck or goose. It has long been prized as one of the greatest and most traditional delicacies of French cuisine. In 2005, it was even enshrined in law as part of the country’s “officially-protected cultural and gastronomic patrimony.” This protection was more than symbolic—it was also economic. Foie gras belongs to the “terroir,” or taste of place, of Southwest France. According to French folklore, this localized practice is centuries old, and knowledge of it dates back even further to ancient Egypt and Rome. Today, about 80 percent of the world’s foie gras production occurs in the Southwest, which uses a European Union food labeling program to claim a “protected geographical indication” for foie gras. When I first traveled there nearly a decade ago, I observed professionally designed billboards for large foie gras companies lining the main highways. Signs inviting travelers to visit small foie gras farms—often hand-drawn to evoke rustic charm or showing cartoon ducks wearing bowties or playing musical instruments—peppered the countryside’s narrow, winding roads and picturesque rolling hills. Tourism information offices in historic town centers distributed fliers from nearby artisanal foie gras farms, entreating visitors to stop by and enjoy a tasting. 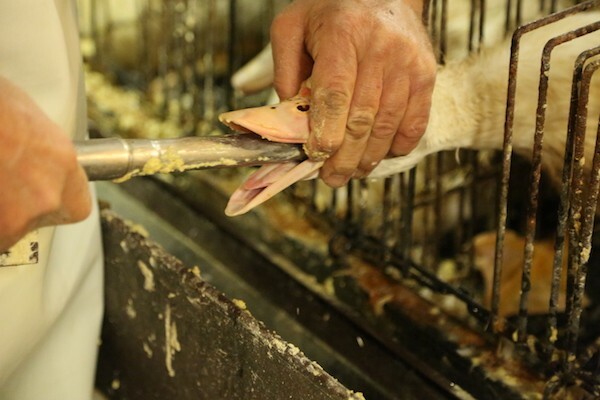 Fattening of ducks for the production of foie gras in France in 2012. 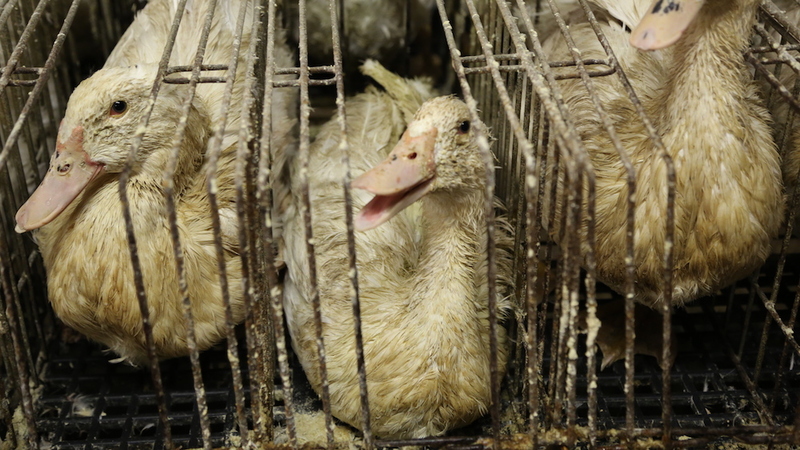 Since the early 2000s, however, the production of foie gras has become hotly contested on moral grounds and has even been outlawed in other European Union countries. The fattening process, called gavage, involves force-feeding the duck or goose with a tube (typically made of metal). This rapidly enlarges the liver six to 10 times in size and increases its fat content to 80 percent over the two-to-three week gavage period. Today, there are two types of gavage used in France: artisanal and industrial. The first method allows farmers to hand feed the birds, while the latter uses a feeding machine. The industrial method is usually contracted by large companies that distribute their brands around the country and world. Opponents to gavage say it is cruel and inhumane because it causes the birds immense pain and suffering and inflicts disease upon their bodies. Foie gras producers and enthusiasts, on the other hand, argue that gavage takes advantage of specific biological features of ducks and geese, which overeat and store fat in their livers prior to long journeys and whose tough esophagi lack nerve endings and gag reflexes that would cause pain. What does it mean for a food to be celebrated and marketed as part of national heritage when it is also morally polarizing worldwide? Many French citizens told me they perceived attacks, symbolic or otherwise, against their nation’s celebrated food practices as assaults on its heritage, culture, and identity. When I asked about bans and critiques of foie gras outside of the country, almost everyone—from everyday consumers to the president of the national industry group—responded doggedly by calling it traditional, authentic, and a part of French heritage. But it’s not quite that simple. How foie gras is marketed to the French public today conveniently obscures the industry’s expansion from a seasonal specialty item into a year-round, multi-billion euro industry. It ignores the fact that the industrial model, spurred by capital and state investment, now accounts for about 90 percent of the country’s total foie gras production. And it was only in the 1980s and 1990s, when France was growing into a larger role in European integration politics and markets, that the country’s southwestern regions also began establishing extensive agri-tourism activities celebrating “fat ducks” and decisively working to craft foie gras as a national treasure—one that needs state protection in the face of outsiders’ vociferous opposition—using the framework of terroir tourism. Municipalities throughout the Southwest have created activities to encourage people not just to visit, but to also partake in the artisanal foie gras experience. If timed right, visitors to these foie gras farms are welcome to watch gavage and butchery. Visitors can also stroll through amateur-designed foie gras museums, shop at newly-created “fat markets” to purchase whole carcasses and livers, and attend “foie gras weekends,” staying in farm guest rooms where the main activity is butchering your own duck or goose to take home. Local officials use these campaigns to acquaint the French and foreigners alike with the production and the producers of foie gras, to increase consumption, and to prove foie gras’s national cultural value. But what is crucial to recognize is that this public face of foie gras—the picturesque, romanticized farms that are conspicuous and welcoming—only accounts for about 10 percent of total national production. Interestingly, local histories and residents reveal that while tensions between artisanal and industrial foie gras producers were common in the past, both kinds of producers are now, for the large part, mutually supportive. Many are neighbors, some even friends, and see themselves as targeting discrete consumer markets. And each benefits from ongoing demand for the other. Despite global opposition to foie gras, French producers of all sizes seem aware of needing to feed a “heritage mentality”—to safeguard this food as an endangered symbol of French national identity and cultural wealth, whether or not traditional production methods are used. French people become complicit through active participation as well as consumption. The work of preserving and promoting foie gras—by artisanal and industrial producers, consumers, and the French state—has become a small but significant way to defend the taste and place of “Frenchness” in the 21st century. Michaela DeSoucey is an assistant professor of sociology at North Carolina State University. Her new book is titled Contested Tastes: Foie Gras and the Politics of Food (Princeton University Press). Primary Editor: Jessica Suerth. Secondary Editor: Sarah Rothbard. *Lead photo courtesy of L214/Wikimedia Commons. Interior photo courtesy of L214/Wikimedia Commons.